Outstanding management of fermentation. Gorgeous. I am very glad to know about aleurone layer that sounds very tasty and healthy. we call it " 糠" NUKA in Japanese. I understood when I translated the word in Japanese. Dear Akiko, Is that so that aleurone is 糠 in Japanese? That is interesting. That particular character in Mandarin means food scraps, and is sometimes used to describe old wives! Yes, It means also " food scraps" in Japanese. In other way, we call it 糊粉層（アリューロン層 ). When I looked up aleurone layer in goo dictionary, it describes it as 糠 ( aleurone) 層 ( layer) that is easy to remember for me. That ( Old wives) is funny.. Shiao-Ping! Gorgeous breads, as usual. Magnificent crumb structure on both breads. I'm thrilled you got the CM Type-85 flour and like it. How about this for coincidence? I have a 1.25 kg miche made with half CM T-85 and half CM AP flour retarding to bake today. I think I actually used more like 1/3 Type-85 and 2/3 AP flour for this bake. In any case, I think I do like the mixture of these flours better than either one alone. However, I seem to regard which every one I've made most recently as my "favorite." What mouthwatering photos and nicely written as always! I am sure you have read about this book here but I am going to mention it again since you are into the realm of whole grains now. It is Peter Reinhart's 'Whole Grain Breads'. His technique of 2 pre ferments really made a huge difference in the results I get with my whole grains. His method can be used on any recipe just by using his percentages to adapt other recipes. Just more fun stuff to experiment with on this bread 'journey'. One never quite knows where it will lead :-). Thank you for posting and your pictures are amazing as usual....What kind of camera DO you use? Thank you Janet. 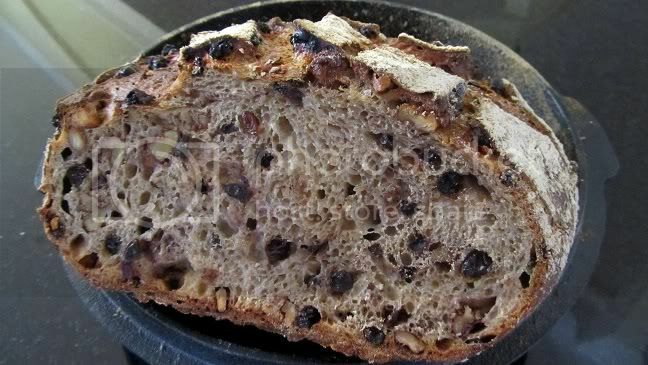 It's interesting you mentioned Peter Reinhart's Whole Grain Breads. You know what - I read that book FROM COVER TO COVER one Chinese New Years's holiday when I was in Taiwan (not this last one, but the one before). I have not baked anything from the book yet, I should try. The camera that I use is Canon SX210 is. 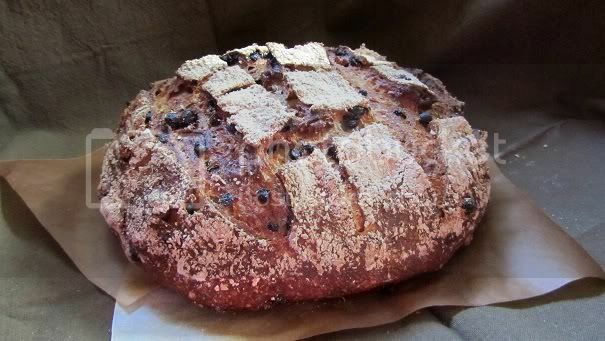 If you try a Reinhart recipe - try his mash bread. I think all of the recipes can be made with SD in place of a biga. It is a dense loaf compared to the loaves you usually post here but I am told the flavor is GREAT due to the mash. It is a very nice bread. My hydration is why above suggested by Reinhart, but I like it this way. I might have over-fermented my sourdough, but the flavour is very good and the crust is amazing. We are not afraid to blow our own trumpet, are we. Thank you, Janet, for the nudge to bake from Reinhart's book. And, by the way, I like your new picture. 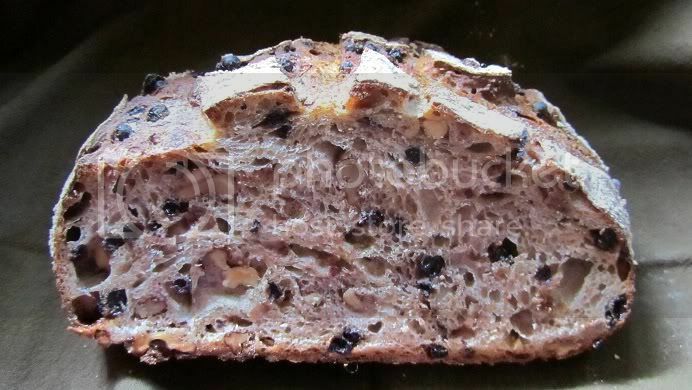 Thanks for posting the picture of your loaf and your 'version' of the recipe. What a beautiful crust color! I will have to try your formula now and see what my kids think of it. 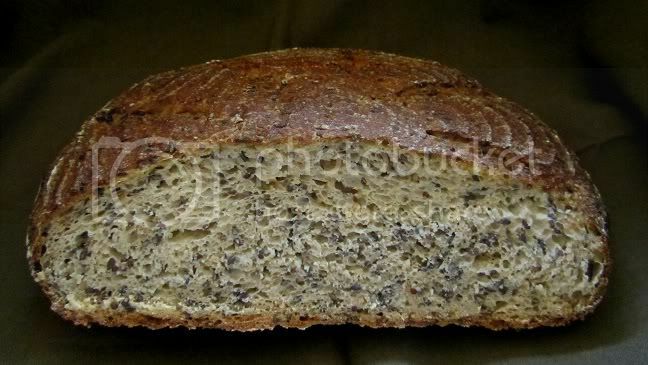 :-) I like your idea of adding the seeds and I am surprised by how open your crumb is. All the extra water really made a difference. My mash loaves are usually a lot denser. 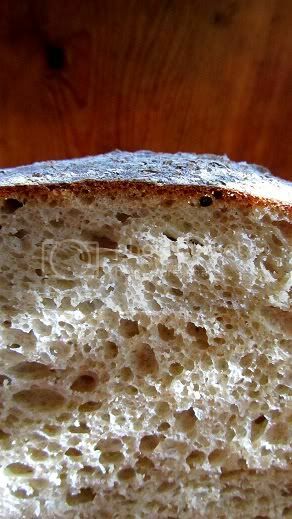 Was the crumb still moist despite it's airiness? I had to get my driver's license renewed and decided if I posing for a new picture there - why not one for here.....so now I have an updated driver's license and a copy of my face here too. :-) The amazing thing being that I actually figured out how to do it with the written help of Sally...only glitch being that when I send messages the photo that pops up there is huge in comparison to the one here.....both loaded at the same time.....oh well. Thanks again for posting your PR loaf! Oh yeah I have seen that too - that the logo photo shows up much bigger when you send messages. The crumb is exceedingly moist. I think you can cut down the hot water for soaking the whole wheat mash by 20 g; ie. a ratio of 1 to 1 is enough. 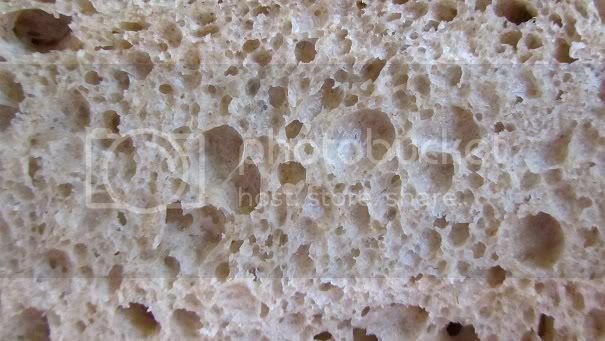 Just make sure your starter is strong, then the bread actually makes itself - I mean, you don't need much mixing or even stretch-and-folds because the acidity in the starter helps develop the strength in the dough. What I did was I mixed the starter with the mash and the extra 100 g WW flour until just combined, autolyse for 45 minutes, THEN, I added the seeds soaker and salt (very light mixing because with the seeds the dough is delicate). In the many hours when it sat on my kitchen bench fermenting, I did only 2 sets of S&F's (I was going to do more, but the dough just didn't look extended out enough to be needing more). Wonderful looking bread and I so enjoyed the discussion of your flours. Just looking at the pictures, I want to just slather it in butter and take a big bite. Just beautiful loaves Shiao-Ping. I also enjoy the CM-T85 flour. Please do show us the Baguette board when you get it. 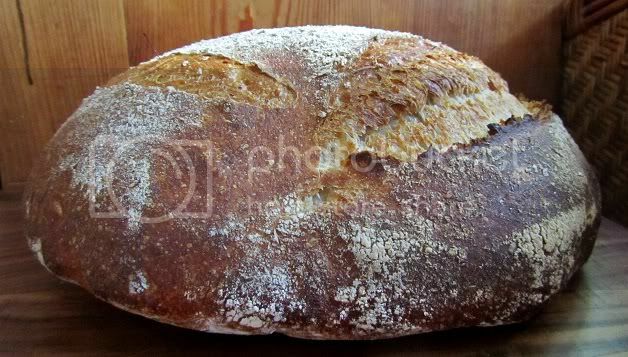 Hi Eric, it was a last minute thing to mention about the baguette board; at the time I had the sneaky feeling that TFLers would be as interested in a bread board as they would sourdoughs. You know why - TFLers are all creative craftsmen, love making things with their hands. Fantastic breads, Shiao-Ping. Great to see you have your bread mojo back and working, and that you have resumed going one step beyond in quest of baking excellence. I look forward to receiving more reports from the cutting edge! 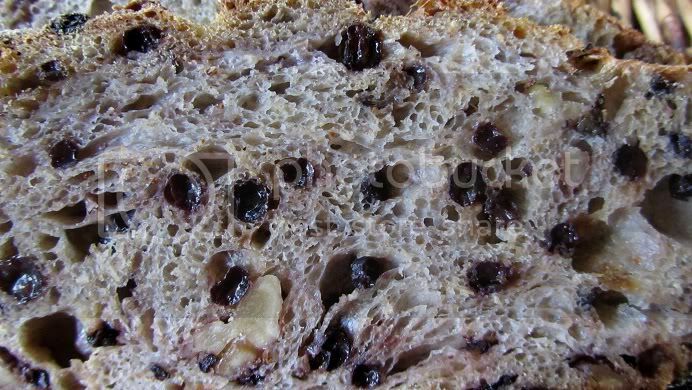 Lovely breads, Shiao Ping and interesting information about aleurone. I had never heard of it before. Your comment about the animals eating better than we do made me laugh, but it is true. We have all been too obsessed with texture and colour in the past (soft white wonderbread) and in the process forgot about flavour. Breads without some form of wholewheat in them seem to lack that 'wheaty' flavour. Your posts to this forum are among some of the ones I always look forward to reading, not only for the well crafted breads you make, but for bringing all of us along in your quest for more flavourful bread and how to achieve it. Thank you for sharing your insight, thoughts, and photos. Thanks, and I'm glad you enjoyed the post on my visit to Cowichan Bay. Vancouver Island has a number of small towns and villages of a similar character, but CowBay (as it's known locally) and Mill Bay are the only ones that have a True Grain Bakery in them, which makes these towns extra special for me. Regarding the logo: It is a wood print of St. Honore, patron Saint of bakers and pastry chefs, that I found on the web when I was setting up my account. I'm sure you've heard of him but in case not the link below has a bit of background on how bakers came to have their very own Saint. Thank you for the information of St. Honore, patron saint of bakers. It is interesting reading too. I guess in ancient times there were many of these patron saints who are revered and treated as protectors. Had to jump in here as I have not seen or heard the word 'Cowichan' for many, many years.....The sweater my father lived in when not at work was a Cowichan sweater. Large bears knitted into the pattern. It was bought from the Cowichan Indians on one of his trips to Canada. When I was about 19 years old I drove up to Vancouver to visit friends and ended up buying wool and a Cowichan sweater pattern....came home and knit myself my own C. sweater but it couldn't have been authentic as it was knit by me.....roots in the US. Shiao-Ping, those are beautiful miches! and thank you for the link to the Flour Treatise. Thanks for asking the question about Franko's logo. I'd wondered too, but never asked. Franko's link to Wikipedia shows May 16 as Feast Day for Saint Honoratus - what timing for your question! Oh but today is not a Feast Day for me, not by a long shot! The crumb structure of both loaves is remarkable! They look delicious. I'm so happy when others enjoy the Central Milling flours. I was at their warehouse Friday and picked up 40 pounds for myself and a certain brother of mine: more of their Organic Artisan Bakers Craft white flour and more of their Organic Hi-Protein Fine whole wheat flour. I wish it were easier for more distant bakers to get the CM flour. Thank you, Glenn. You go through flours very fast. Isn't it nice to drive to your favourite miller to pick up your favourite flours. I wouldn't mind it myself. It would be a luxury. I have been going through the CM's Artisan Bakers Craft pretty quickly. I use it in place of other "all-purpose" flours in a variety of uses. It costs about the same as King Arthur AP, so why not support a local business (especially one that is so deserving of support). As to the luxury of going to Central Milling's warehouse, I have to admit it is fun to go to the source of flours used by so many great artisan bakeries. I'm tempted to try as many of their flours as I can, but I need to work on reproducibility of my favorite loaves more than I need to broaden my repertoire. Glad you like "our" flour, but remember Petaluma is just the location of their warehouse. The mill is in Utah and the wheat fields are all over the Northern Plains. Thank you, Glenn, for letting me know. I didn't know the Petaluma office is just their warehouse. How lucky you are. 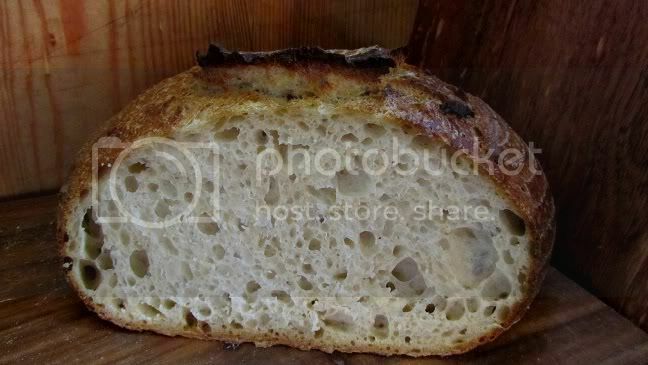 I phoned Nicky Giusto of Central Milling where I got my Type 85 flour for the bread in this post. I am sure if I dig hard enough at the data bank on The Fresh Loaf I would get the answers to my queries but I am impatient. To talk to the people in the know seems to be a quicker way. The answer is the latter. It has to do with how the high extraction flour is made. Nicky said that after they peel off the flakes of the wheat kernel, ie. the outer layer/ the bran, they then mill the softer inner layer together with the germ. The process is done manually. The second question that I have is how a home baker simulate high extraction flour at home. 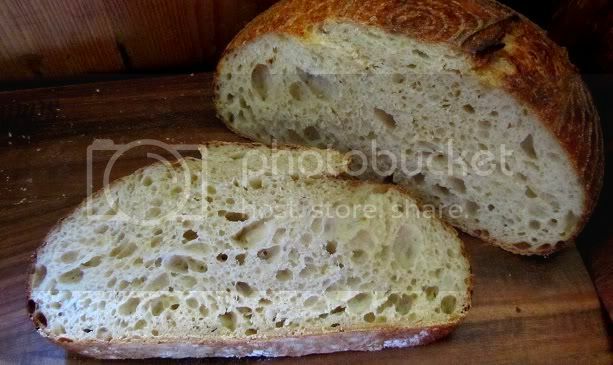 I asked if Hamelman’s suggestion of using a blend of 85 – 90% wholewheat flour and 10 -15% white bread flour a good simulation (see Hamelman’s Bread, page 165 under Miche, Pointe-a-Calliere). To my surprise, Nicky said NOT AT ALL. 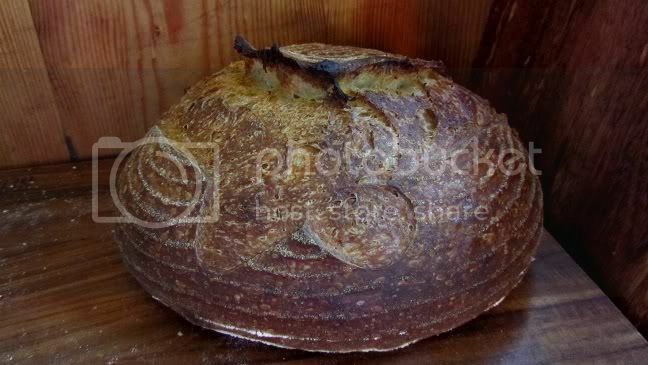 He said a good place to start would be 75% bread flour and 25% wholewheat flour, or 70% bread flour and 30% wholewheat flour. He said the bread flour has to be a good hard red winter wheat ALL-PURPOSE FLOUR and the wholewheat flour has to be a good hard red winter wheat 100% WHOLE WHEAT FLOUR, not some of the reconstituted so-called whole wheat flour where only the brans are added back in and no germ. I asked him about hard white winter wheat (common in Australia) and he said the ones they tested lacked a flavour dimension and performance dimension that they like. Nicky knows his stuff! A family of flour geeks who are great bakers. I note that the SFBI Miche formula calls for all-purpose flour plus wheat germ. No bran. 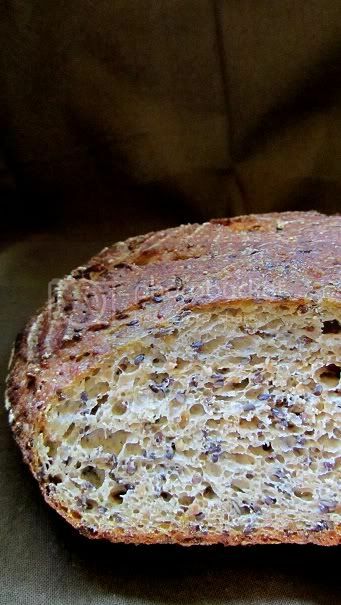 I decided that I would like to add some colors to the pale looking crumbs in this post, so I made a walnut & current sourdough using the Type 85 malted flour that I have and a rye starter. 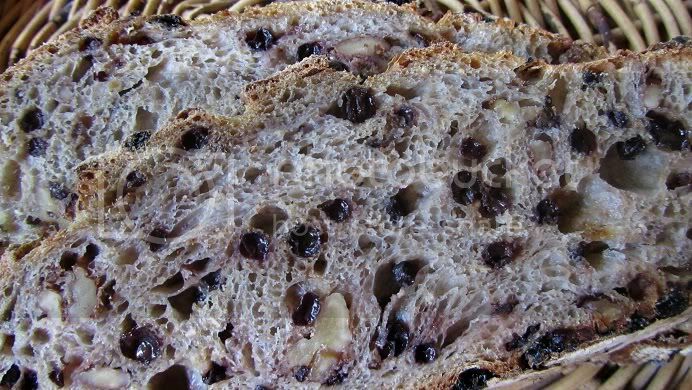 My formula is very simple and straight forward but, for me, it is a winning combination that brings together the most flavors for a simple fruit and nut sourdough. This 1.1 kg dough has an overall hydration of 80% (not taking into account the water for rinsing the currents). It is essential to soak/rinse the currents; more sweetness will be released for the dough. I don't find any spice or any other ingredient is needed for this bread. 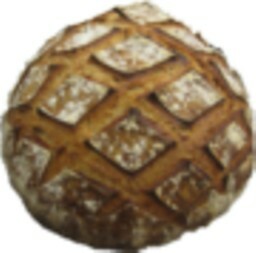 It is a beautiful bread to have. It looks wonderful, Shiao-Ping! Your scoring is very beautiful as well. I really like the crumb, Shiao-Ping. We have recently developed together with a client an aleurone recovery machine which recovers flour stuck on the bran layer.